Conducted by Nikolaus Harnoncourt, one of the most innovative and influential conductors of the second half of the 20th century, the Chamber Orchestra of Europe performs Wolfgang Amadeus Mozart’s Symphony No. 39 in E-flat major, K. 543; Symphony No. 40 in G minor, KV. 550; and Symphony No. 41 in C major, K. 551 (nicknamed the Jupiter Symphony). Mozarts’s 39th symphony was completed on 26 June 1788. It is the first of a set of three (his last symphonies) that Mozart composed in rapid succession during the summer of 1788. No. 40 was completed 25 July and No. 41 on 10 August. Adagio, common time – Allegro, 3/4 (in sonata form) The first movement opens with a majestic introduction with fanfares heard in the brass section. This is followed by an Allegro in sonata form, though while several features – the loud outburst following the soft opening, for instance – connect it with the galant school that influences the earliest of his symphonies. The independence of the winds and greater interplay of the parts in general, and the fact that the second theme group in those earlier symphonies was (to paraphrase Alfred Einstein) practically always completely trivial, which is not the case here, combine with the second group which contains several themes, including a particularly felicitous “walking theme”. These are just a very few of the points that distinguish this movement from those works, from which it has more differences than similarities. Andante con moto in A-flat major, 2/4 (in modified sonata form without development) The slow movement, in abridged sonata form, i.e. no development section, starts quietly in the strings and expands into the rest of the orchestra. Quiet main material and energetic, somewhat agitated transitions characterize this movement. The key is A-flat major, the subdominant of E-flat major. Menuetto (Allegretto) – Trio, 3/4 (in compound ternary form) The work has a very interesting minuet and trio. The trio is an Austrian folk dance called a “ländler” and features a clarinet solo. The forceful Menuetto is set off by the trio’s unusual tint of the second clarinet playing arpeggios in its low (chalumeau) register. The melody for this particular folk dance derived from local drinking songs which were popular in Vienna during the late 18th century. Allegro, 2/4 (in sonata form) The finale is another sonata form whose main theme, like that of the later string quintet in D, is mostly a scale, here ascending and descending. The development section is dramatic; there is no coda, but both the exposition, and the development through the end of the recapitulation, are requested to be, and often are, repeated. Symphony No. 40 in G minor, KV. 550 is sometimes referred to as the “Great G minor symphony,” to distinguish it from the “Little G minor symphony,” No. 25. The two are the only extant minor key symphonies Mozart wrote. The symphony is scored (in its revised version) for flute, 2 oboes, 2 clarinets, 2 bassoons, 2 horns, and strings. Notably missing are trumpets and timpani. The nickname of the symphony, “Jupiter” stems not from Mozart but rather was likely coined by the German violinist, composer, conductor and musical impresario Johann Peter Salomon (1745-1815) in an early arrangement for piano. The 41st Symphony is the last of a set of three that Mozart composed in rapid succession during the summer of 1788. The 39th was completed on 26 June and the 40th on 25 July. 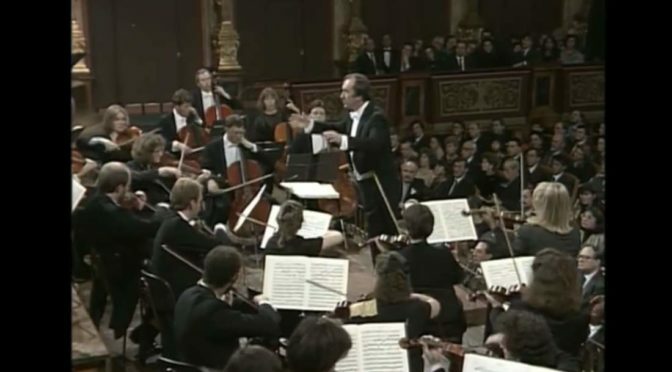 Nikolaus Harnoncourt argues that Mozart composed the three symphonies as a unified work, pointing, among other things, to the fact that the Symphony No. 41, as the final work, has no introduction (unlike No. 39) but has a grand finale. Around the same time as he composed the three symphonies, Mozart was writing his piano trios in E major K. 542, and C major K. 548, his piano sonata No 16 in C K. 545 – the so-called Sonata facile, and a violin sonatina. It is not known whether the 41st Symphony was ever performed in the composer’s lifetime. According to Otto Erich Deutsch, around this time Mozart was preparing to hold a series of “Concerts in the Casino” in a new casino in the Spiegelgasse owned by Philipp Otto. Mozart even sent a pair of tickets for this series to his friend Michael Puchberg. But it seems impossible to determine whether the concert series was held, or was cancelled for lack of interest. Allegro vivace, 4/4 The sonata form first movement’s main theme begins with contrasting motifs: a threefold tutti outburst on the fundamental tone (respectively, by an ascending motion leading in a triplet from the dominant tone underneath to the fundamental one), followed by a more lyrical response. This exchange is heard twice and then followed by an extended series of fanfares. What follows is a transitional passage where the two contrasting motifs are expanded and developed. From there, the second theme group begins with a lyrical section in G major which ends suspended on a seventh chord and is followed by a stormy section in C minor. Following a full stop, the expositional coda begins which quotes Mozart’s insertion aria “Un bacio di mano”, K. 541 and then ends the exposition on a series of fanfares. The development begins with a modulation from G major to E flat major where the insertion-aria theme is then repeated and extensively developed. A false recapitulation then occurs where the movement’s opening theme returns, but softly and in F major. The first theme group’s final flourishes then are extensively developed against a chromatically falling bass followed by a restatement of the end of the insertion aria then leading to C major for the recapitulation. With the exception of the usual key transpositions and some expansion of the minor key sections, the recapitulation proceeds in a regular fashion. Andante cantabile, 3/4 in F major The second movement, also in sonata form, is a sarabande of the French type in F major (the subdominant key of C major) similar to those found in the keyboard suites of Johann Sebastian Bach. Menuetto: Allegretto – Trio, 3/4 The third movement, a Menuetto marked allegretto is similar to a Ländler, a popular Austrian folk dance form. Midway through the movement there is a chromatic progression in which sparse imitative textures are presented by the woodwinds (bars 43 to 51) before the full orchestra returns. In the trio section of the movement, the four-note figure that will form the main theme of the last movement appears prominently (bars 68 to 71), but on the seventh degree of the scale rather than the first, and in a minor key rather than a major, giving it a very different character.